The peacock network has finally announced a start date for the last season of Friday Night Lights. The series will finish its run on DirecTV next week, on February 8th, and the 13 episodes will then run on NBC on Fridays at 10pm beginning April 15th. The series finale is scheduled to air on July 8th. As mentioned last week, if you don’t have DirecTV and don’t want to wait until July to see the finale, you always purchase the season five DVD set. In an interesting move, the final season of Friday Night Lights is being released on DVD some 10 days before the NBC premiere. It’s available on Amazon for $26.99 . What do you think? Will you wait for the episodes to run on NBC, buy them on DVD, or watch via some other method? 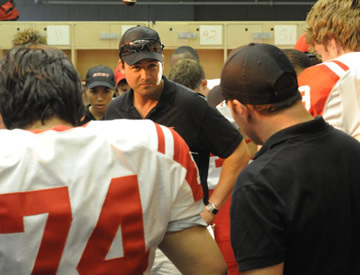 Friday Night Lights: Renewed for Season Two! I would love to see them bring Friday Night Lights back. Best show on. Something to look forward to watching for a change. Now, nothing but garbage and reality oh yea, I said garbage already..Bring it back please or hopefully another network will pick it up very soon. love watching NCIS. adore gibbs and ducky. amused by abby. love ziva, mcgee and tony. YES to continuing seasons of NCIS! Gosh, why would I buy Season 5 and watch it from start to finish at my own leisure when I can watch it on NBC (the network that pulled this incredibly series in the first place) with full commercial interruption? Now there’s a tough choice. Thanks to Amazon I had the 5th season in hand by April 5. Watched the Finale last night. Amazing show…good for DirectTV…goodbye to NBC. come on nbc….get it togeather and listen to the people!!!! Watched the final show last night on Direct TV. Well done. What a great ending to a great show. I loved the whole season. I can’t believe it’s over. It is worth the money to buy the season 5 DVD’s. This show will missed. I can not believe this Show is not going to return, there are so many different paths they could take this show which would be better than cancelling it. Everyone is saying it and NO ONE (in the Tv world) is listening. With the shows out there and a show like this that can involve people from 13-65 with anywhere from loyality, morals, everyday life experiences makes the football theme an after thought. The fact that you can relate to people in the series, not to mention lifes roadbumps is unlike most other shows out there. Its quite sad, but I really am gonna miss this show like some of the other great ones I have watched over the last 20 years! Looking forward to 5th season of Friday Night Lights. It is such a shame that it is not coming back for a 6th. There is so much absolute rubbish on TV that is allowed to go on and on and a brilliant show like FNL is thrown under the bus!